Safe, effective, and convenient. You can sleep with it on! Rechargeable battery that charges like a cell phone! 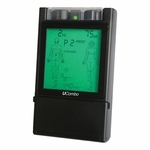 Safe, effective, and convenient TENS unit for hand pain. You can sleep with it on! Rechargable battery that charges like a cell phone! 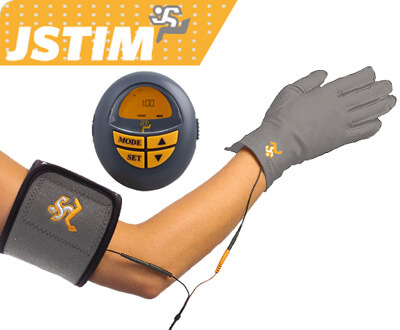 The JStim Joint Therapy System for the Hand is a combinational electrotherapy device that works simultaneously with soft, multi-layered conductive fabric and safe infrared heat to deliver effective and efficient therapy to the afflicted joint. These combined therapies are compressed against the treatment site using compression wraps, allowing the silver garment electrodes and infrared heat band to emit therapy directly into the target joint. These compression gloves for Rheumatoid Arthritis and Osteoarthritis have become breakthrough treatment method. By sending tiny electrical impulses to the joint and adding compression it can work to help relieve pain, increase blood circulation, and reduce symptoms associated with Osteoarthritis and Rheumatoid Arthritis. 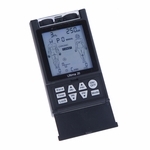 This JStim TENS unit for hand pain has two modes of operation: Daytime (DT) and Nighttime (NT). 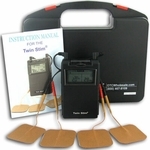 The NT Mode is the main, intended, and default treatment mode of the JStim System. It was designed as a cumulative therapy program and is specifically for nighttime use and/or 5 – 7 hour therapy sessions. The different treatment times you can choose from in this mode are (in hours): 1:45, 3:30, 5:15, or 7:00. The DT Mode is simply TENS settings. It is only intended to use while awake for either short or long periods of time. DO NOT SLEEP WITH THE JSTIM DEVICE ON IN THIS SETTING! The DT Mode contains 3 Sub-Modes: Normal (N), Burst (B), and Modulation (M). In this mode there are additional treatment times that can be used instead of those found in the NT Mode. The additional treatment times are (in hours): 0:00 (indicates continuous treatment), 0:30, or 1:00. Can be used at night! Charges like a cell phone! It's safe, effective and convenient - you can use even at night while you're sleeping! Can be used at night. 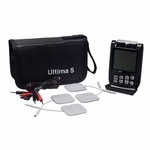 JStim is an external, non-narcotic, electrotherapy system which can be used as a combined therapy in reducing pain levels and symptoms associated with Arthritis (including Osteoarthritis and Rheumatoid Arthritis). For optimal results it is recommended by the manufacturer to be used for 5 - 7 hours daily, 5 – 6 days per week. It works as a cumulative therapy process meaning that benefits of use and improvements are often seen over time and not immediately. Improvements typically begin after 3 months of use and after 6months to a year (approximately 1500 hours) even better results should be noticed. Once a certain pattern of relief can be seen and maintained therapy can then be scaled back. 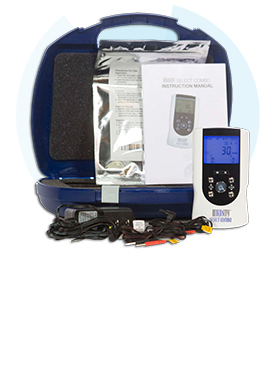 The JStim Joint Therapy System uses a Lithium-Ion Battery and is charged through a cord to the device while the battery is still inside similar to a cell phone battery. 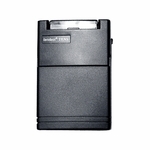 The manufacturer recommends that after approximately 2000 Hours of use the battery will need to be watched and a replacement battery may be necessary. The battery must be charged before a session begins and the charging cable will need to be removed before the device becomes operational following charging. Be sure to charge your unit before each treatment! Familiarize yourself with the components that make up the Jstim System. Try on the orange conductive glove for a custom stretch then remove. Apply the armband to the upper portion (around the biceps area) of the same arm as the glove. Make sure the black electrode of the armband is positioned on the outside of the bicep. Make sure that it is also comfortable and tight. 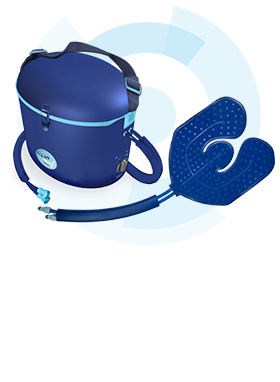 If using your Jstim to treat both hands, alternate treatment sessions, one day per each. Once all leads are connected and items are in place, turn on the device using switch on side. Slide switch to 'Lock' to lock settings. This is the default mode on the Jstim unit. To change the mode press the MODE key. DO NOT sleep with your Jstim Unit on in this mode! 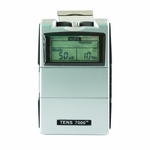 In this mode is simply a TENS unit. To select sub-modes press the SET key, the 'N' icon on the screen will start flashing. Use the Increase or Decrease button to select the desired sub-mode. Once the sub-mode is selected press the SET key again to confirm the choice. The treatment time for DT mode with flash. Press the Increase or Decrease to get to the desired treatment time. Between 0:00, 0:30, and 1:00. Do not place the pads on the cartoid sinuses located at the two sides of the neck (where a doctor feels for pulse), or over the eyes. 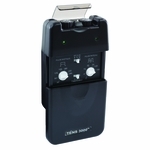 Do not use this Jstim unit if you have a heart pacemaker or serious heart rhythm problem. Do not place your electrodes or wraps on any non-intended body parts or treatment areas unless discussed with a physician. 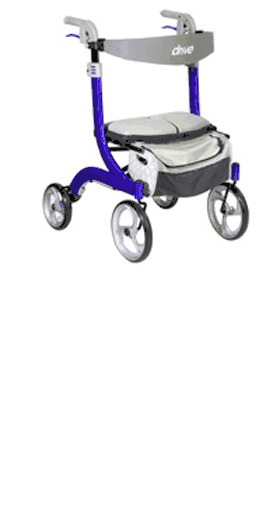 Do not use the Jstim unit during pregnancy or at anytime on the abdomen during pregnancy. The Jstim unit is not effective for pain of central origin (including headaches). The Jstim unit should be used only under the continued supervision of a physician. The Jstim unit has no curative value. The Jstim is a symptomatic treatment which suppresses the sensaion of pain, which would otherwise serve as a protective mechanism. The user must keep the device out of the reach of children. 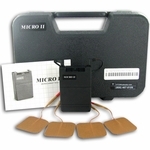 Electronic monitoring equipment may not opperate properly when Jstim stimulation is in use. Do not use Jstim unit if you are driving or operating machinery. If you have epilepsy, consult your doctor about use of the Jstim. 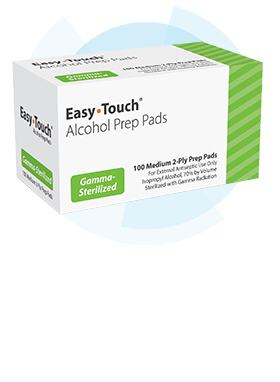 Do not apply pads to skin that does not have normal sensation. If the skin is numb, stimulation will not be felt and too great an intensity might then be used accidentally. Skin Prep Ingredients: Water, Potassium Chloride, Calcium Silicate, Sodium Chloride, Coloring.